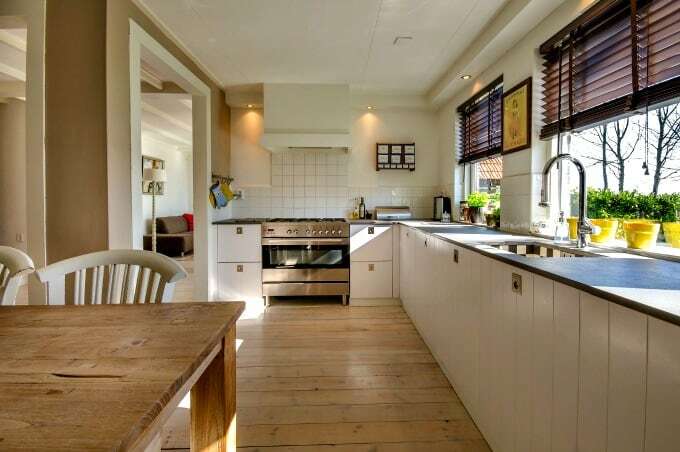 Home » How to Have a Spotless Kitchen All. The. Time. Since it’s the most-often used room in the house, many of us wonder how to have a spotless kitchen. It is, after all, the room where we feed and nurture our family and where friends gather — even when we try entertaining in a different place. If you’re an avid home cook, like I am, it’s also the room where you go to create, explore, and unwind. With all of that activity, how do we keep the kitchen clean without spending all of our time cleaning the kitchen? Here are some tricks to the trade followed by cleaning experts and restaurant chefs who have to not only make fantastic food but also keep health inspectors happy. Now you can make these tricks your own. 1. Do it while you’re doing it. One hard and fast rule that professional chefs and tidy people follow is to clean as you are cooking. If you don’t have a dishwasher, keep a sink full of soapy water so you can wash and rinse utensils, bowls, etc., as you cook. This also helps prevent cross-contamination since you won’t have dripping, dirty dishes sharing counter space with the food you’re preparing. 2. Keep it curated. Decide what decorations and small appliances earn their spot on your counters and put the rest away. If you only bake now and then, there is no reason to surrender counter space to your stand mixer. Find a home for it in a cupboard and just leave out things you use at least once a week. Most importantly, if you can’t wash something don’t display it on your kitchen counter where it will collect grease and dust. 3. Make cleanup easy. Having to hunt for cleaning supplies or walk across the kitchen to toss waste means you’ll do it less often. Keep a bottle of non-toxic, homemade all-purpose cleaner and a few microfiber cloths tucked under your kitchen sink to tackle spills right away. When preparing food, set a bowl on the counter to hold wrappers and packaging so you can take it all to the trash in one trip. Don’t forget to keep a bag out for vegetable peels and other reusable kitchen scraps, too! 4. Don’t let things sit. Take time to wash dishes and wipe counters after every meal or snack rather than leaving the dishes for later. Doing so keeps your sink free so you can clean things as you work (Rule #1). Got a pan that must soak before scrubbing? Set a reminder on your watch or phone to deal with it in an hour and then do so. Wipe counters and the stovetop, even the inside of the microwave if it’s a mess. Set out a clean towel for the next day and take the dirty one to the laundry room. 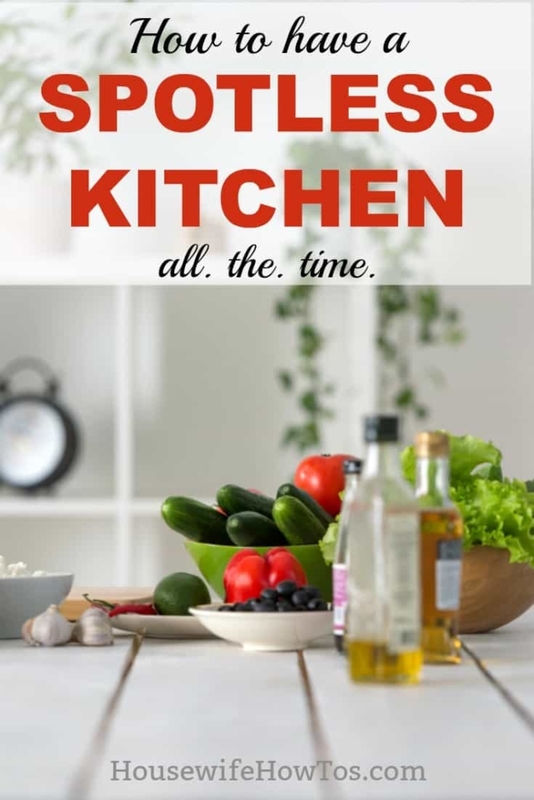 Finally, don’t forget to do a thorough weekly kitchen cleaning and a kitchen deep cleaning at least once a year and you’ll have a spotless kitchen 24/7/365. Like this? Please Pin it to your Cleaning board! Love your book and routines. I now do the Daily every day without prompting. Sure would like an app for my iphone though to send me reminders of the other cleaning jobs….I find too many reasons to ignore my printed list!